Western Australian researchers have observed large groups of dolphins engaging in what they described as “homosexual behaviour” after the mating season finishes. Scientists at the Mandurah Dolphin Research Project noticed that after mating season was over, male bottlenose dolphins in the Peel Harvey Estuary were “mounting” and “having genital contact” with each other. “These dolphins, all but three of them juveniles, organised themselves in four subgroups in which they were observed engaging in socio-sexual behavior that included mounting and genital contact between individuals,” researcher Krista Nicholson, from Murdoch University, told the Mandurah Mail. Nicholson said that the behaviour was typical of bottlenose dolphins, and it appears to play an important part in the development of close bonds between males as they negotiate dominance and alliances. 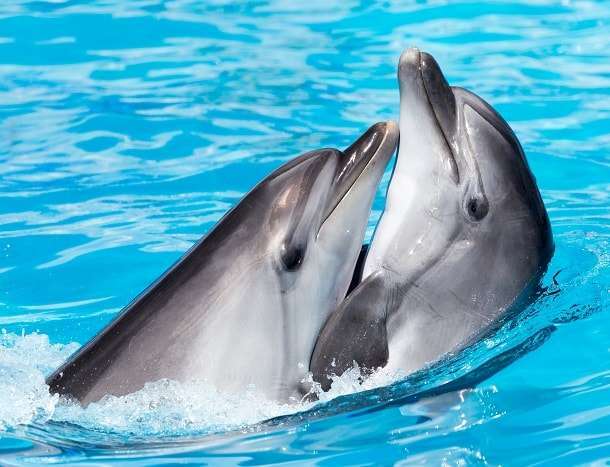 She said previous research had found that in Shark Bay, located 800 km north of Perth, pairs of male dolphins were more likely to mate for life than two female dolphins or two dolphins of different genders.